If you’re not in the routine, finding the motivation to exercise Take Your Exercise Routine to the Next Level With Fitbit and IFTTT Take Your Exercise Routine to the Next Level With Fitbit and IFTTT Here, we'll dig deeper into the many ways that Fitbit and IFTTT can work together to make your life better. Read More can be incredibly hard. It’s tiring, it leaves you feeling sore 5 Tools to Relieve Back Pain or Exercise Individual Muscles 5 Tools to Relieve Back Pain or Exercise Individual Muscles The human body needs exercise, without which it develops several problems, like back pain. These top resources show that fitness can be simple with the right exercises for any body part. Read More , and for many people, it’s just not enjoyable. If that describes you, take a look at the cool infographic below. It features 21 reasons that exercising is something you want to do! Print it out. Save it to your phone. Put it next to your bed. Whenever you feel like you need a reason to work out, pull it out and find your motivation How Watching 3 Motivational Videos a Day Changed My Life How Watching 3 Motivational Videos a Day Changed My Life Want to see if motivational videos have any kind of impact on your life? If you have a dream that you've been putting off, try a life experiment of watching motivational videos every day. Read More ! 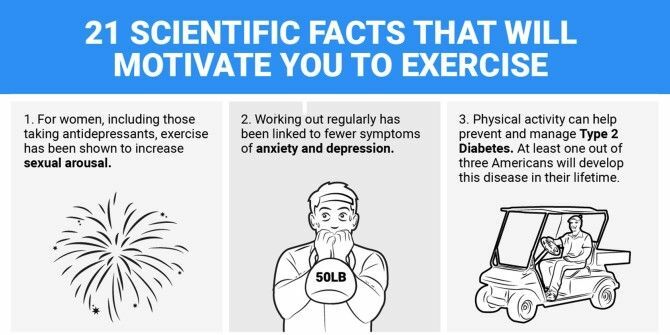 Explore more about: Fitness, Infographic. Learn Pokemon Go Safety in 15 SecondsHow Has Computer Science Changed Over the Years?